SYNETIS, MUCH MORE THAN CONSULTING. SYNETIS possesses wide technological skills and numerous expertises that allow us to offer our clients a wide variety of solutions. Each SYNETIS team member possesses a specific expertise in the technological platform on which he intervenes. On the other hand, SYNETIS accumulates the results of its experiences, both in the process and in the method of work, as well as in project management. The expertise acquired by our engineers, consultants and projects managers during their degree courses is enhanced and improved thanks to the trainings done by software publishers and by the certifications obtained from our partners. Obviously, the most important software-package related expertise results from the acquired experience throughout the projects, as well as by a permanent upgrade linked to updates and newer versions. Internally, the access to our libraries, to the regular exchanges with the publishers within our premises allows to build a common knowledge. Our best practices result from this sharing and are permanently set up in favor of our clients. SYNETIS’ consultants support you in an efficient, pragmatic and personalized way achieve your projects of implementation and optimization of governance, risk management, internal control and audit, as well as in your projects of regulatory compliance and/or normative. 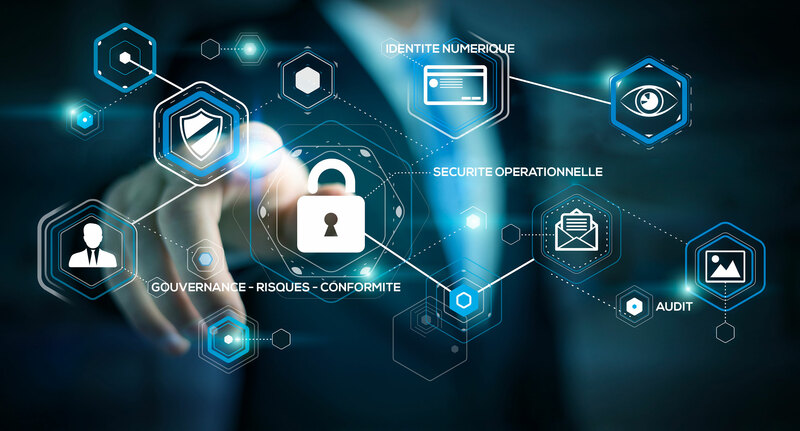 Since its creation, SYNETIS positioned itself in the field of authorization management and developed a global approach answering the new problems of authorization, identity and access management and bringing the clients an expertise both technical and organizational. A guarantee of traceability to comply with legal and/or regulatory obligations. SYNETIS allows you to benefit from its know-how and from its numerous experience feedbacks to set up projects by iteration and hence, avoid “tunnel” effects. Custom-made TPAM (Third Party Application Maintenance). Création, modification, suppression des comptes et de leur droits dans les applications / systèmes cibles en mode automatique, manuel (notification, création de tickets) ou mixte. IDaaS (Identity as a Service) : problématiques des identités dans le cloud. L’authentification est un mécanisme permettant d’obtenir la preuve de l’identité de l’utilisateur. Le PAM (Privileged Access Management) consiste à gérer les comptes à privilège. Un compte à privilège est un compte qui dispose d’un accès administratif à des systèmes critiques. Ces comptes représentent des vecteurs d’attaque aussi bien internes qu’externes. En effet, un administrateur peut réaliser des changements non autorisés, ou accéder à des données confidentielles. Un attaquant externe peut utiliser le compte d’un administrateur pour obtenir des accès non autorisés. une rupture de flux : les solutions de PAM sont positionnées en rupture de flux (interdiction de l’accès direct aux ressources) et en rupture de compte (utilisation d’un compte de service pour les systèmes cibles). Les clients de Synetis ont fortement évolué vers une stratégie qui replace au centre des enjeux leurs propres clients. Le CIAM (Customer Identity and Access Management) sont des solutions qui répondent notamment à ce nouveau challenge. La problématique est cependant complètement différente, à commencer par les processus. Les processus d’inscription sont à l’initiative du client lui-même (via le social login ou des formulaires d’inscription très courts pour ne pas perdre le client). Tout ceci pour servir non pas la sécurité mais surtout et quasi exclusivement le marketing qui souhaite « profiler » les clients au travers de traces, d’analyses de tout le parcours du client sur leurs sites afin de lui proposer toujours des nouvelles opérations ( type fidélité, soldes privés, …). Synetis a su s’adapter à ce nouvel enjeu au travers de mission de conseils et d’intégration. Regarding realization and solution integration, our experiences are multiple, our returns on investments are demonstrable and our competences and methodology are proven. The “Digital trust” rests on a good perception between underlying risks (attacks on sensitive data, identity theft, etc..) and regulatory requirements. Since its creation SYNETIS had a constant concern of always being in the vanguard regarding IS security. It seemed natural to enrich our offers catalog throughout our growth, in order to anticipate the future needs of our clients. The “digital trust” offer of SYNETIS depicts this anticipation to answer the new needs of our clients with pro-activity. Indeed, the accelerated development of digital economy urges companies to exchange more and more digital acts at the expense of papers forms. This situation questions certain practices and established agreements and conventions:. With its international and national projects, SYNETIS has built up a pre-eminent position in the fields of security, associating a know-how of project ownership and field experience feedbacks (complex architecture studies, demonstrators (POC), solution integration..).SYNETIS brings pragmatism through clear recommendations and a proven iterative methodology. Since its creation, SYNETIS took position in the field of security and developed a global approach answering the problems by bringing to its clients an expertise both technical and organizational. Our clients are part of the largest french and international companies. We intervene and take actions with business and IT departments within the framework of their strategic reflections, their initiative in innovation and their transformation projects. Our goal is to help our clients choose appropriately, either projects or services. For that purpose, we accompany them in their projects. Building on dozens of integration projects, from the simplest to the most complex solutions in different environments and business sectors, SYNETIS offers to its clients its know-how in terms of integration so as to supply a “turnkey” solution.